CAMP LEATHERNECK, Afghanistan — Three weeks after flying out of Washington, D.C., photographer James Lee and I have reached a milestone midway on our assignment in Helmand province. We arrived today on this forward operating base from Kajaki district, marking the conclusion of our media embed with 1st Battalion, 8th Marines, out of Camp Lejeune, N.C. I’d personally like to thank all the Marines in the unit who shared their world with us, from battalion commander Lt. Col. Kevin Trimble right on down to the many lance corporals we trailed outside the wire on patrols. If you’ve been following this blog, you’ve no doubt noticed the many slice-of-life pieces we’ve posted in the last few weeks. That’s part of our assignment. However, in coming days you’ll also find links here on Battle Rattle to a variety of hard-news stories stemming from our time in Afghanistan. Marines of many ranks have assessed everything from their hardships and sacrifices to what Helmand province might look like after a drawdown in forces. We’ll share their thoughts along with our own observations in stories appearing in our print and online editions. For now, we remain here at Leatherneck plugging away on our work. Stay tuned for more dispatches here — we should be embedding with another infantry unit soon enough. HMMMMMM look at all that POPPY=$$$$$$ SEMPER CHIVA……. 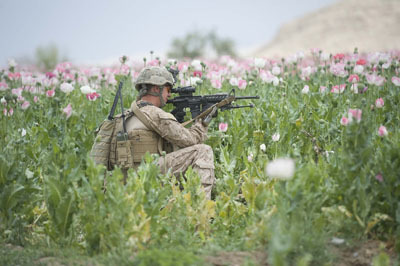 How many Marines get cracked for opiate abuse overthere? Wish I was swimming in that wonderful crop. Keep protecting our Percocet, Vicoden, Oxycontin, and Heroin supply Marines your doing a good job. First of all, I didn’t realize those poppys were so pretty! Secondly, I think it must be a wonderful, and humbling experience for you guys to be able to spend time with our Marines and to share in the lives of what they go through. Nice for us to read. My son is over there, staying for acclimation, then off to his FOB like so many others. It’s nice to be able to imagine what he might be seeing, through your eyes. God Bless and Semper Fi! Ya Kim there are beautiful and great for the “HEAD” too and wonderful it is!!!!! Thank you for keeping us up to date on their world. As a mom it’s nice to be able to see what it’s like over there ,and makes me feel a little more connected to my son. I also am looking forward to reading and veiwing pictures of 1/7 Animal Company. God Bless and Semper Fi!